authorities and civil organizations dealing with immigrants, as well as the representatives of the French political life. The study aimed to examine the French public opinion on immigration and immigrants depending on the trends of immigration and terrorist attacks in the country. The research design applied the data of eight nation-wide polls from the past five years upon the determination of their level of reliability. The method involved summing up the descriptive statistics along fourfocus events: Charlie Hebdo in January 2015, Bataclan in November 2015, Nizza in July 2016, and Marseille in October 2017. The study highlighted the convergence between the French public opinion and the proposal on the new immigration law, according to the polls. 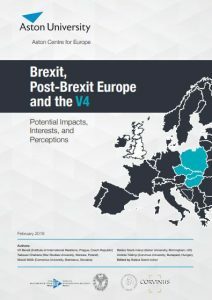 The purpose of this report is to map the interests of the Visegrad 4 countries (V4; the Czech Republic, Hungary, Poland and Slovakia) towards Brexit and post-Brexit Europe, and identify similarities in the views of the four countries where they can work together. Specifically, the report examines V4 interests towards three aspects of Brexit and post-Brexit Europe: interests towards the EU-UK deal itself; interests related to Brexit-induced changes in the UK; and interests on EU level changes caused by Brexit. All three aspects are analysed with a focus on economic, security and institutional issues.